Technological behaviour, environmental mediation and socials links, ‘YOU DO YOU’ is an ambitious project sharing experiments trough the eyes of the emerging generation of artists who, through the exhibition, invite you to discover an alternative view of our world. 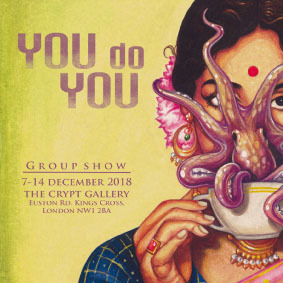 Coming from Italy, India, UK and France, we invited 6 artists to present a selection of work ranging of rare prints, installations, performances, paintings and digital videos representing their artistic practice at the unique venue of the Crypt Gallery in London. Printemps (France) shifts back and forth between physical and digital spreading a new language to the ‘community’, Green Riot (France) and his street-biology explores humans ecosystems, Priyesh Trivedi (India) his ‘sad-series’ raise irony as an Art, Rouge (France) through her paintings and urban interventions explores tales of neighbourhoods, shifting gaze through small figurative fables. ROUGE through its cut-out shapes, street- collages, and paintings, offers to the public an alternative reading of the urban landscape.By confronting a singular artistic practice of the new figuration with multiple socials references to the walls of cities, ROUGE explores connection between communities, highlighting this poetry making us part of our living places, districts and neighbourhoods. By giving humans forms to plants GREEN RIOT with his Green Graffiti’s tries to open a dialogue between human beings and their biological environments, highlighting their common traits, as their reactions to the reality of survival, their fundamental necessity to live in a community. Territorial Wars, Food, Duplication, Waste management, these same problematic issues that we find in the heart of our contemporary civilization apply to complex systems of plants. Priyesh Trivedi is the creator of the famous ‘Adarsh Balak’, professionally trained as an animated filmmaker. He has worked on the design of several cartoon projects while continuing his independent artistic activities. The terrible child returns today to his first love: stunning visuals through trans-disciplinary installations. Do you speak geek? Printemps works on the disturbance of her generation in the face of continuous flux and flows of information, this bit language shapes the displacement of conviction and portrays the new nihilism forms of the time and its relation to the media.